Ed. note: More on the continuing saga of Boeing’s incompetence and corruption concerning the Boeing 737 MAX and the FAA’s complicity. True, flying is safe and the record fairly good but when two Boeing aircraft crash killing over 300 people what’s the price? Should passengers pay extra for flying on aircraft with compromised technology so as to not crash? The preliminary report on the March 10 Ethiopian Airline crash shows that the advice given by the FAA and Boeing to 737 MAX pilots was incomplete. The pilots followed the advice but it was physically impossible for them to bring the plane back into a stable flight. In October 2018 a brand new Boeing 737 MAX airplane, flown by the Indonesian Lion Air airline, crashed into the sea shortly after take off. 189 people died. An investigation found that Boeing had added a ‘maneuver characteristics augmentation system’ (MCAS) to the MAX that could directly influence the stabilizer, a primary flight control surfaces, but based its decisions on the input of only one sensor. When the sensor failed the system went wild and destabilized the airplane. Neither the pilots nor the airlines knew about the system. The regulators. which certified the plane as safe to fly, were misinformed about it. They had directed Boeing to include the new system into training material for the pilots which Boeing, for commercial reasons, did not do. After the Lion Air crash the Federal Aviation Administration issued an Airworthiness Directive 2018-23-51 which advised 737 MAX pilots how to handle an MCAS failure. 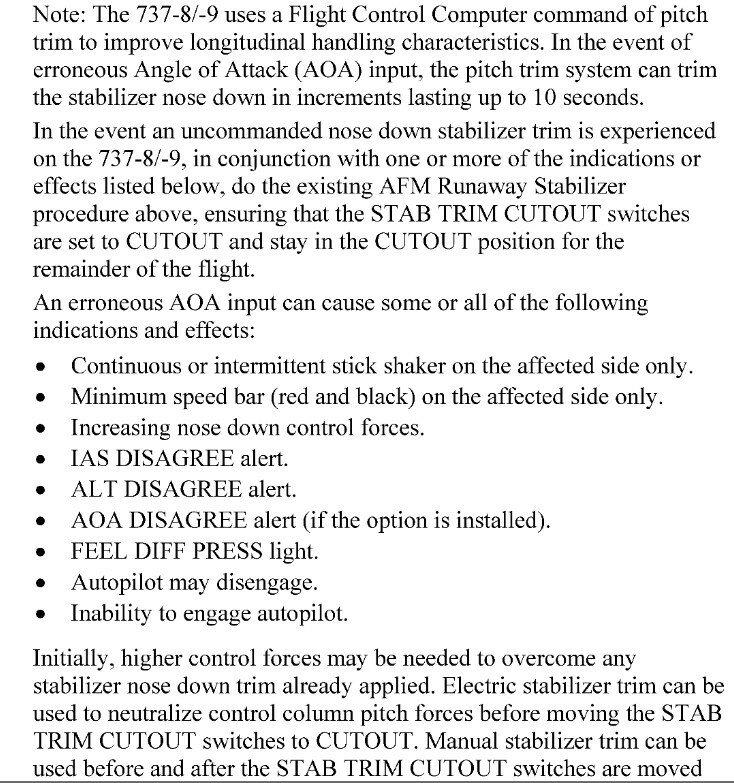 The FAA told 737 MAX pilots to use the Stabilizer Trim Cutoff switches to interrupt the power supply for the system’s actuator, a motor driven jackscrew in the back of the airplane. The pilots should then use the manual trim wheels in the cockpit, which move the jackscrew and stabilizer via steel cables, to correct the aircraft. On March 10 a 737 MAX flown by Ethiopian Airline crashed shortly after take off. 157 people died. Radar data and debris found showed that the cause was likely a similar MCAS failure as had happened on the Indonesian Lion Air flight. All 737 MAX planes were grounded with the U.S. being the last country to order it. The preliminary report clearly showed that the Ethiopian Airlines pilots who were commanding Flight ET 302/10 March have followed the Boeing recommended and FAA approved emergency procedures to handle the most difficult emergency situation created on the airplane. Despite their hard work and full compliance with the emergency procedures, it was very unfortunate that they could not recover the airplane from the persistence of nose diving. The procedure Boeing and the FAA advised to use was insufficient to bring the aircraft back under control. It was in fact impossible to recover the plane. The possibility of this to happen was discussed in pilot fora and on specialized websites for some time. Please go to Moon of Alabama to read the entire article.